The tale of the 47 Ronin has been depicted in plays, films and television, and is even currently being retread by Hollywood with Keanu Reeves in the lead role. There is no shortage of material detailing the exploits of the ronin and their sacrifice, the tale being one of the most recognized in Japanese culture. "Samurai Vendetta" scribes Daisuke Ito and Kosuke Gomi decided to take a notably different approach with their film by using the 47 Ronin merely as a backdrop to tell a story that unfolds on the fringes of the assassination. Tange Tanzen (Raizo Ichikawa) and Yasubei Nakayama (Shintaro Katsu) are students at opposing sword schools. When Nakayama is duelling a group of samurai, Tanzen, the honourable samurai that he is, informs Nakayama the cord tying his kimono is not of sufficient strength to endure the rigours of battle and will most surely come lose, hindering his ability to fence. Unbeknownst to Tanzen, the men Nakayama faces are those of Tanzens school. After a fierce display of swordsmanship, Nakayama is expelled from his school so that the rival school will not hold a grudge, and Tanzen is also expelled as an act of good faith, along with his involvement with the Nakayama at the duel. But the two samurai’s crossing paths do not end there. They soon find themselves embroiled in either the service of Lord Kira, the soon to be assassinated court official, or the ronin who want to see him dead, as well as becoming embroiled in a love triangle with Chiharu (Chitose Maki), the daughter of one of the officials plotting to kill Kira. Their fates are doomed to be intertwined, although tension builds as it becomes unclear if Nakayama and Tanzen will find themselves on the same or opposing sides of the assassination. "Samurai Vendetta" features two heavyweights of the chanbara genre, and the script does a terrific job of creating a complex web of political intrigue that the two wounded souls must traverse. Katsu’s character Yasubei Nakayama was one of the real 47 ronin involved in the killing Lord Kira, who eventually adopted the name Yasubei Horibe. Raizo Ichikawa’s character Tange Tenzen is entirely fictional, although he shares a lot in common with another fictional character Tange Sazen, a character writer Daisuke Ito directed silent films about in the 1920’s starring Denjiro Okochi, and continued writing about for decades to come. Seems Ito was very conscious about the tale he was weaving. Because the tale of the 47 Ronin is the backdrop, and much of the politics that led up the assassination is either depicted or talked about here, it is assumed that you as the viewer know the history, and if you don’t, you will unfortunately be lost. Lucky for you, if you have the Animeigo DVD (or the internet for that matter), they provide you with a warning and notes so you can familiarize yourself. 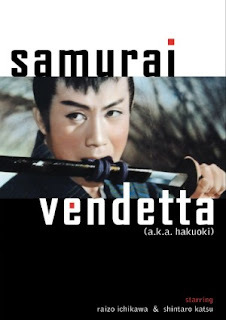 "Samurai Vendetta" has some flourishes of great chanbara action thanks to the keen eye of Kazuo Mori, notably the final duel in the snow that uses the great fencing skills of Shintaro Katsu and the lesser skills of Raizo Ichikawa, and a duel on a bridge between Tange Tenzen and a group of samurai out for blood. The final duel must have inspired Chang Cheh and his One Armed Swordsman (or the character of Tange Sazen perhaps provided the inspiration), which isn’t really a stretch since Shaw brothers borrowed heavily from Japanese chanbara films. On a cinematic level, there is a very similar feel in the finale to that of John Woo’s "The Killer". The duel on a bridge features Tenzen partaking in the duel and then recounting it after the fact in a great theatrical display as he tries to determine who the men he killed were. There’s also a lot of exposition, political melodrama and intrigue that will either keep you enrapt or bore you to death, depending on your tastes. If you’re looking for a chanbara film jammed full of swordplay and bloody mayhem, this is not that film. But if you’re looking for a chanbara film with a fine balance of swordplay and political intrigue, this is that film. It leaves you guessing right to the bitter end how the paths of Nakayama and Tenzen will finally cross and in. Whilst it’s inevitable that Nakayama survives to perform the assassination of Lord Kira, the fate of Tenzen and their love interest Chiharu is not so easily defined, and writers Ito and Gomi exploit that to maximum effect. I've heard this story.Looks like a good film.Thanks for detailed information.I'll watch as soon as possible if this movie has Turkish subtitle.